Tired of a slow internet connection? Don't want to spend a fortune upgrading your line speed? 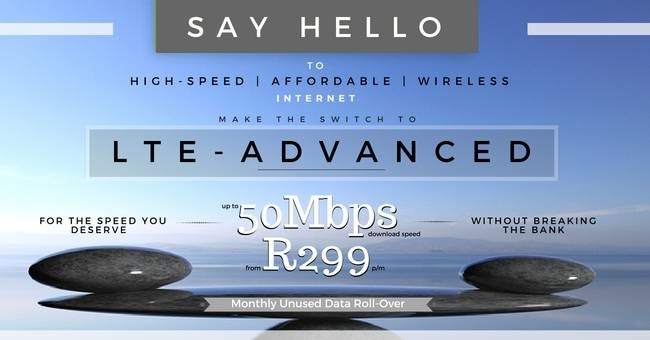 Get internet speeds of up to 50Mbps from as little as R299p/m with LTE-Advanced! No landline? No problem! With LTE-Advanced (LTE-A) you can enjoy internet access without an ADSL or Fibre connection from just about anywhere, with the added bonus of your connection being portable! Quick and Easy Setup – Once your service is activated, all you need to do is plug in your router and you're "A" for Away! Multiple Connections, Uncompromised Speed – Your router provides a stable WiFi hotspot that can be used by multiple people at once without compromising connection speed. Transparent Costs – No nasty surprises with out of bundle rates, no contract is required, and billing is prepaid month-to-month. It's Flexible – With our affordable range of Top-up options, easily Top-up your data during the month if you run out. Unused Data Carry-Over for one Additional Calendar Month – Giving you extra time to make the most of your data. Subscribers will receive Threshold Notifications via email - This means, you will be notified at different stages of your bundle use (50%, 80%, and 100% depletion) in order for you to better monitor your data usage. Get faster internet access today, without breaking the bank. Make the smart choice and switch to iSAT's LTE-A. For more information on LTE-A, click here. Legal Notice - This email complies completely with the South African ECT Act of 2002. This email was sent to events@worcesterbusiness.co.za. Click here to change your Newsletter Preferences via our website. Please note that this is an unattended mailbox. Should you wish to contact us, please feel free to do so via our website. Our friendly support staff will be happy to assist you with any queries.